Not everyone uses the same signature for all their e-mails. Most of us have different signatures for our professional and personal e-mails. Managing them on your iOS device does not have to be a hassle though. Signatures for iPad is an email signature manager that lets you store and use multiple signatures on your tablet or smartphone. Signatures manages an unlimited number of e-mail signatures. It handles formatted and regular text entries. Adding new entries to the app is pretty easy. You can copy each signature to your clipboard to paste it wherever you prefer. The app does not put a limit on your signature length. It does let you order your lists too. 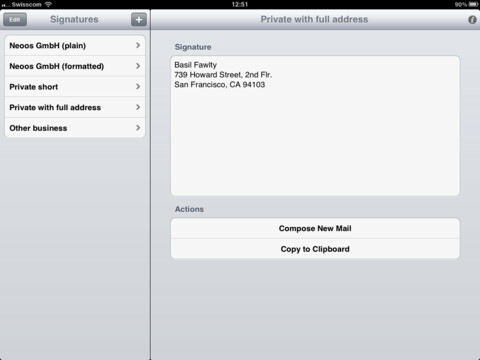 Signatures for iPad is pretty decent and has a lot of potential. 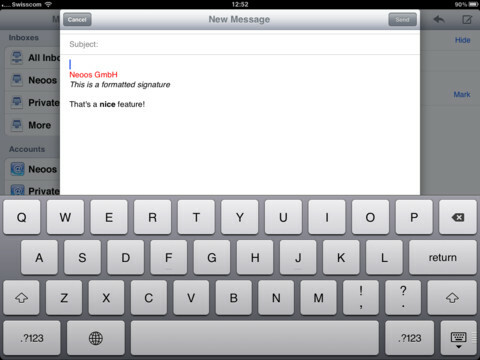 We would love to be able to sync our signatures across multiple devices. More advanced editing functionality would be nice too. Not perfect but gets the job done.